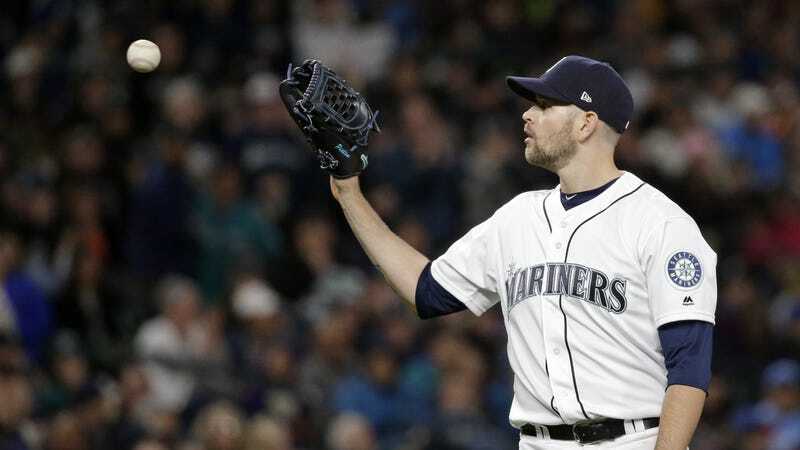 It’s likely you went into this season without planning on paying too much attention to the Seattle Mariners, but maybe their 28-year-old power lefty, James Paxton, will change that. In three starts so far, Paxton has gone six, seven, and eight innings without allowing a single run. That’s a total of eight hits, four walks, and twenty-two strikeouts from the 75 batters he’s faced this season. On Saturday against the Rangers, he carried a no-hitter into the fifth inning and threw 79 of his 114 pitches for strikes. In February, Brett Miller at Fangraphs boldly predicted that Paxton will win the 2017 AL Cy Young award, largely on the strength his newly dominant fastball. Paxton’s heater used to come in at around 94 mph in 2015, but a change in arm slot bumped the average velocity on that pitch up to 96 mph last season. Miller argues that the AL Cy Young pool is without any certifiable competition, other than Corey Kluber (read Miller’s post before you jump in with comments about the Red Sox rotation, please), and that Paxton will greatly benefit from an upgraded outfield comprised Jarrod Dyson, Leonys Martin, and Mitch Haniger. It’s a bit early to make any determinations about Cy Young awards, but if Paxton remains on the dominant path he’s started the season on, he’ll bolster—and maybe anchor—a rotation that includes King Felix. Unfortunately, the Mariners are off to a mediocre start, and are unlikely to break out this season as a sneaky contender. If they do, Paxton will have a lot to do with it.